Once in a while we stumble on some really interesting under the radar projects that are interesting as an idea and show great potential for growth, often by coincidence or getting advice to check them out by friends or readers. Here comes another one of these called Merit that has been launched a few months ago and has been growing steadily and mostly under the radar, because it is an invite only network where you actually “mine” the invites as well as the Merit (MRT) coins. Merit uses a controlled-growth model, so that there will not be a quick hype, but instead slower, but safer growth of the whole ecosystem with changes and improvements along the way making things better and easier. One of the good things about the project is that you actually can mine coins, we like mining crypto coins and we are sure you do so as well, but there are also other ways to earn coins like the Growth Rewards that are a kind of a lottery system for rewarding people for growing the network. After you learn you can mine coins, the next logical question is if you can trade them somewhere, so is there and exchange where Merit (MRT) is being traded? Yes, there is, an official Merit Market that is already doing quite good. In the market you can directly trade MRT coins with other users, buying or selling them for Bitcoin (BTC) via an escrow service that works surprisingly quickly and efficiently. Merit is not yet on some of the big and popular crypto exchanges, but sooner or later that will happen inevitably as the project continues to grow. Let us get back to mining and dig a little deeper into it. The PoW algorithm Merti uses is called Cuckoo cycle and it is a new one like many of the things in the whole project and that is one of the things that makes it interesting and attractive. The target block time is 60 seconds and the block reward is 20 MRT, though only half of it goes to the miners and the other half goes for the growth rewards. The difficulty is being retargeted every 300 blocks or roughly about every 5 hours and thanks to the controlled-growth model it should not be moving very rapidly up or down. The total supply of MRT coins is 100 Million with 20M premined in the genesis block, so far there a little below 7 million coins mined. Initially Merit was mineable only with CPU, but now there is also an Nvidia GPU miner available that is much faster, though its performance is CPU dependent. An AMD miner is being worked on, but is not yet available, so people with Nvidia mining rigs have the advantage here. In the table above you can see an estimate performance for the latest generation of Nvidia GPUs for mining MRT, though if you have slow Celeron CPU on your mining rig the actual performance for a 6 or more GPU mining rig will most likely be slower than that. At the moment 1 MRT is about 5000 satoshi in terms of a price, though that value can vary, here is a Merit mining calculator to get an idea how much coins you can mine in a day depending on your mining hardware (use the table above as a reference) and to see what profit you can expect to get from mining Merit coins. 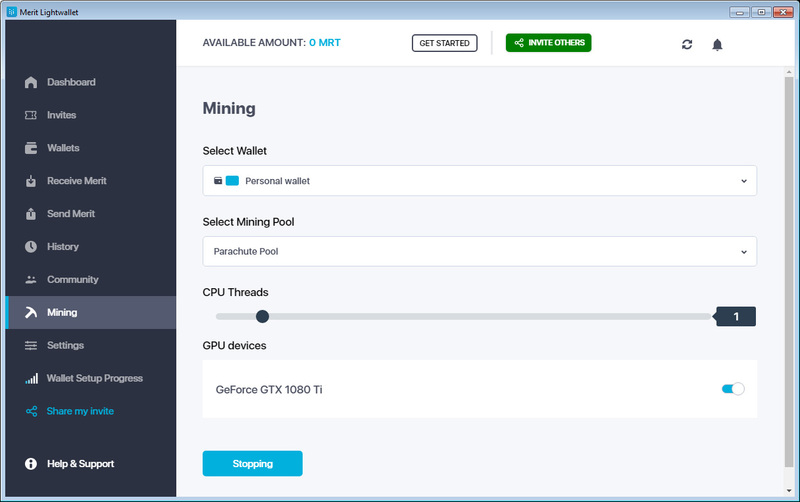 Currently there are two ways that you can GPU mine Merit (MRT), either by using the Merit Lightwallet that has a built-in CPU and GPU mining feature or use the console Merit miner currently the latest version is 0.4 available for both Windows and Linux. The full wallet called Merit Core does support only CPU mining, so no need to use it for mining, the best way is to use the console miners on your mining rigs. Since the two official mining pools are not very detailed on the stats, you might also want to check out the third party solution available at https://icemining.ca/, it is smaller in terms of hashrate, but is something that most miners should be more familiar in terms of functionality and most importantly stats for their mining process. It is always a good idea to spread the hashrate and to have an alternative as a backup in case some of the official pools goes down for maintenance for example. We have been trying out Merit for some time before actually writing about it as there were quite a few things that we did not like an/or understand when we initially were pointed out to the project, but since then we’ve seen a lot of improvements even though there is more to be desired. Since the miner is CPU intensive, even though you are GPU mining it might crash over time or slowdown, so we have devised the above batch file (BAT) for Windows that addresses these issues. You might want to use it if your mining rig is with a slower CPU like a Celeron processor for example or even a Pentium in order to set the miner to lower priority and restart it every 30 minutes to be on the safe side. Make sure you change the wallet address, the gpu parameter sets the IDs of your available Nvidia video cards, set to 6 above, the cores parameter set to 0 is to not mine on the CPU. Now, if you are ready to give Merit a try you can click on the link below and create your account / wallet address. Do note that since Merit is an invite-only after you visit the invite link and register you will need to have your account activated. We have a limited number of invites available, so please do not waste them, we are going to send invites as soon as possible, but your account may not get activated immediately if we are not available at the moment. Sending multiple invite requests will not get you accepted faster, in fact will have the opposite effect! We have some more new invites available, so feel free to apply for one if you are interested, again a limited number, so do not waste time.